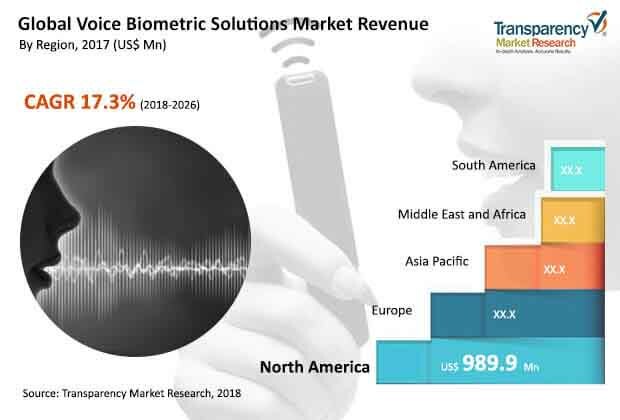 According to a new market report published by Transparency Market Research, the global voice biometric solution market is expected to reach a value of US$ 13,049.2 Mn by 2026 on account of growing adoption of voice biometric solutions and biometric technology across various industries. The market is projected to expand at a CAGR of 17.3% during the forecast period from 2018 to 2026.Asia Pacific is anticipated to experience healthy growth which is expected to be followed by Middle East & Africa during the forecast period.The authentication speech recognition software segment is expected to see flourishing growth, owing to rising demand for authentication and client and customer verification solutions. Rapid developments in technologies for authentication and payment purposes have made it possible for the biometrics industry to increase the number of consumers across the world. There has been a significant need for technological solutions in biometric technology due to its advance features that helps in enhancing authentication and verification solutions. This is likely to create strong demand for voice biometric solutions in the near future. Similarly, vendors across countries such as China, India, the U.S., Australia, Germany, Finland, Singapore, and Denmark are focusing on enhancing voice biometric technological aspects of the biometric technology. Public agencies as well as private companies are also emphasizing on providing voice biometric solutions mainly due to the benefits offered by biometric technology, as these solutions are highly effective for improving the performance and infrastructure of organizations across regions. The voice biometric solution market is segmented based on solution, application, end-user, and geography. According to the research study, the automatic speech recognition software market is anticipated to experience flourishing growth during the forecast period. This is mainly due to its multiple applications in most industries such as BFSI, government, healthcare, call centers etc. In addition to this, various users across regions prefer speech recognition to be the reliable authentication solution compared to PINs and passwords. By 2026, automotive speech recognition software is projected to cover more than 60% of the global market. Apart from this, access security application also plays a vital role in supplementing the growth of the voice biometric solution market. Vendors are integrating voice biometric solutions due to the rise in need for authentication and fraud detection and customer verification solutions. Furthermore, the payments segment is likely to hold a significant share of the voice biometric solutions market. North America is leading the voice biometric solution market with more than 30% share globally. This is due to increase in advance technologies for voice biometric solutions and also high penetration of biometric solutions in the region. Furthermore, strong presence of voice biometric solution providers across the region is contributing to the growth of the market. North America is contributing the highest share in the voice biometric solution market because the U.S. is considered as a highly developed country in terms of technological innovations and adoptions. In terms of new opportunities, Asia Pacific is expected to witness healthy growth during the forecast period. Increasing awareness of voice biometric technology as well as adoption of advance and technological solutions in the biometric industry across countries such as Singapore, India, South Korea, Taiwan, China, Malaysia, and Thailand is expected to offer prominent opportunities to the voice biometric solution market. The research study includes profiles of leading companies operating in the global voice biometric solution market. Some of the key players profiled in the market include Agnitio SL., Bioid Ag, Nuance Communications, OneValult, VoiceTrust Ag.,ValidSoft, Ltd,VoicePass Technology, VoiceVault, Voice Biometrics Group Limited, Qualcomm Technologies, Inc., Auraya Systems, Geamlto N.V. and Verint Systems.